Milder flavored than most other onion-family crops, you can mulch long-season varieties in fall for winter and spring harvest. Well-drained, rich soil, high in organic matter. Optimum pH is 6.2 to 6.8. Requires plentiful, even moisture for good yields. Biennial grown as an annual. 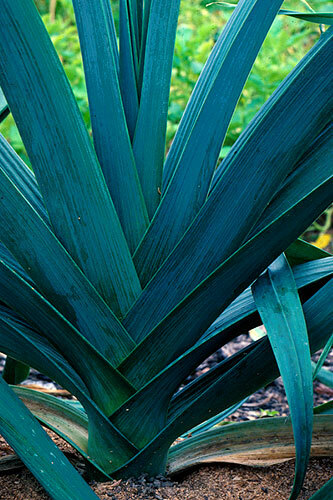 Long-season varieties have a dark, bluish-green color. frost - More frost-tolerant than other cultivated onions. not native to North America - Cultivated in Egypt more than 4,000 years ago. Germination temperature: 45 F to 95 F - Peak germination around 77 F.
Seed can be saved 3 years. Choose a weed-free, well-drained location. Raised beds are ideal. Leeks are good for intercropping with other garden plants, especially early-maturing spring greens. Do not plant where other onion family crops have been grown in the past 3 years. You can direct-seed leeks, or start transplants indoors. Long-season varieties are best started indoors. Start transplants about 8 to 10 weeks before last frost date. Sow seeds in flats about � inch apart and � inch deep. Transplant to cell-type containers when they are about 2 inches tall. If you skip this step and continue growing in open flats, simply tease apart and trim roots when transplanting into the garden. Around the average last day of frost, set hardened-off transplants 4 to 8 inches deep, 4 to 6 inches apart, in rows 20 inches apart. Deep planting reduces need for hilling to blanch the base of the plants. Transplants should be about 6 to 12 inches tall - the bigger, the better. Only a few inches of leaf need to show above the soil. Direct seed about 4 weeks before average last frost � inch deep, 1 inch apart, in rows 20 inches apart. Thin to 4 to 6 inches apart. Hill or mound soil around stems several times to blanch as leeks grow. (A single large hilling while plants are young can cause them to rot.) Or, place a portion of cardboard paper towel center around the lower part of the stem. Leeks have shallow root systems and need consistent moisture and good weed control. Water weekly if weather is dry, and mulch to retain moisture and suppress weeds. Onion maggot - Use floating row covers to prevent infestations. 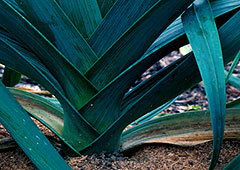 Browse leek varieties at our Vegetable Varieties for Gardeners website. Grow early or nonhardy varieties for summer harvest. They mature in as little as 50 days after transplanting and will withstand some frost. Grow late or hardy varieties for fall and winter harvest. They take can take 100 or more days to mature, but can withstand heavy freezes. If well-mulched in fall, they can be harvested through winter and into spring in many places. Elephant garlic (great-headed garlic) is a member of this species. See garlic for more information.